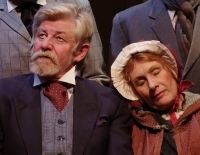 Returning to Bawds after more than twenty years, Peterss recent performances for the company include NICHOLAS NICKLEBY (Ralph Nickleby) and THE CHERRY ORCHARD (Lopakhin). 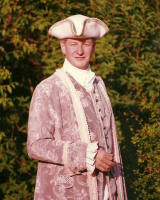 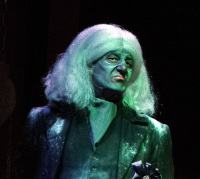 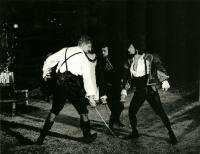 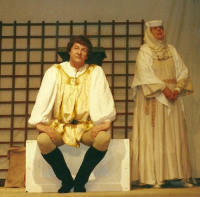 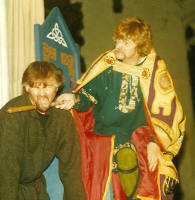 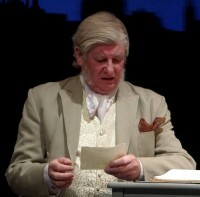 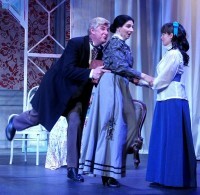 Earlier performances for Bawds include THE DOUBLE DEALER (Maskwell), OTHELLO (Cassio), WYRD SISTERS (King Verence), THE OLD CURIOSITY SHOP (The Single Gentleman), BAREFOOT IN THE PARK (Victor Velasco), THE SCHOOL FOR SCANDAL (Sir Oliver Surface), MASKERADE (Mr Salzella), ONE NIGHT IN NOVEMBER (pictured above as Ken Widdows), WAITING FOR LEFTY (Voice / Fayette / Grady), THE COUNT OF MONTE CRISTO (Gerard de Villefort), EMMA (Mr Woodhouse) and MURDER IN THE CATHEDRAL (Thomas Becket). 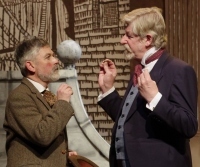 Other roles in Cambridge include BREAKING THE CODE (Alfred Dillwyn 'Dilly' Knox), THE REAL INSPECTOR HOUND (Magnus), HABEAS CORPUS (Canon Throbbing) and THE WEIR (Jack) AS YOU LIKE IT (Jaques), AN AUGUST BANK HOLIDAY LARK (John Farrar) and THE TEMPEST (Prospero). 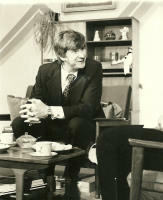 Productions for other companies include DEATH OF A SALESMAN (Willy Loman), MACBETH (Macbeth), THE WINTER'S TALE (Leontes), RACING DEMON (Lionel Espy), SHE STOOPS TO CONQUER (Mr Hardcastle), A DOLL'S HOUSE (Torvald), PYGMALION (Henry Higgins), MUCH ADO ABOUT NOTHING (Benedick), THE IMPORTANCE OF BEING EARNEST (Jack Worthing), THE SEAGULL (Trigorin), THE BIRTHDAY PARTY (Stanley), LOVE'S LABOUR'S LOST (Berowne), THE MERRY WIVES OF WINDSOR (Master Ford), CHICKEN SOUP WITH BARLEY (Harry Khan), ABSENT FRIENDS (Colin), MOTHER COURAGE (The Cook), THE DRESSER (Norman), WHOSE LIFE IS IT ANYWAY? 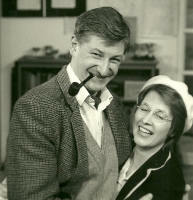 (Ken Harrison), THE BROWNING VERSION (Andrew Crocker Harris), HARLEQUINADE (Arthur Gosport), THE HAPPIEST DAYS OF YOUR LIFE (Rupert Billings) LIFE x 3 (Hubert), OUTSIDE EDGE (Roger), THE TEMPEST (Prospero) and THE GIRL IN THE GLASS (M R James). 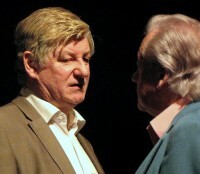 Directing credits include ALL MY SONS, OUR COUNTRY'S GOOD, THE MEMORY OF WATER, ALICE IN WONDERLAND, A WARWICKSHIRE TESTIMONY and ERNIE'S INCREDIBLE ILLUCINATIONS. 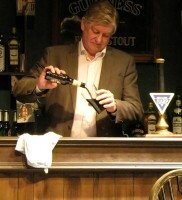 Film appearances include SECONDS FROM DISASTER : NAGASAKI (Henry Stimson) for the National Geographic Channel in 2012.